We will be celebrating Shabbat and Hanukkah this week in our new home! Please join us! We are delighted to tell you that we will be celebrating Hanukkah in our new home! Our first service there will be this Friday, December 7, at 7:00 p.m., in Suite 200 of 151 Warren St. in Lowell. 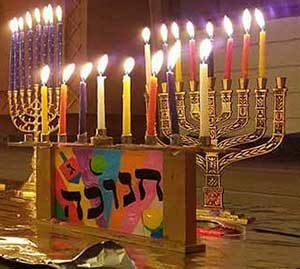 We will hold a Shabbat service and our annual dazzling multi-hanukkiah (menorah) lighting. (Please bring yours—and candles—if you have one.) We will also be dedicating our space by putting up a mezuzah—significantly, on the holiday that commemorates the rededication of the Temple in Jerusalem. As with that original rededication, however, things are still a little ungepatchged (Yiddish for “mixed up”) as we will not yet have fully unpacked and gotten set up. We felt we would all prefer to tolerate a little clutter rather than miss this opportunity to be together for the holiday. Thank you for your understanding. We are also planning a bigger opening celebration in January, when we will invite friends from the wider Lowell community to join with us. Please stay tuned for details. Note that there is on-site parking and a security system with an intercom, and the building is accessible to those with disabilities. (Accessible parking spots are in the lot marked Parking I below.) 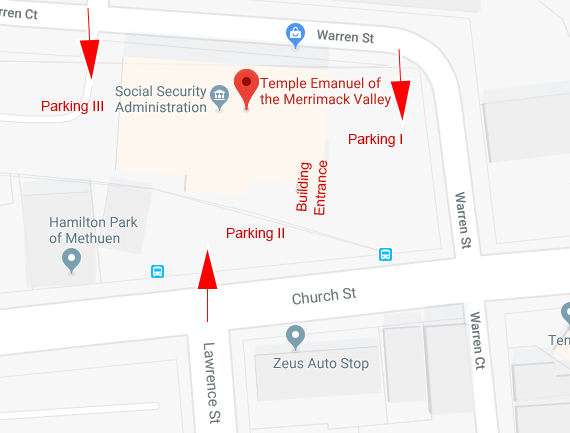 Some parking spaces say they are reserved for tenants of other suites, but we may use them after business hours if they are not occupied by those tenants. Arrows indicate entrances to parking lots. For Hanukkah music, try the Maccabeats Ed Sheeran parody or Six13’s Bohemian Chanukah. Please join us in our new space at 151 Warren St., Suite 200, for a family morning of jelly doughnuts and latkes, dreidel games and crafts, and some music and dancing. Although our space is not fully prepared, we will have a fun morning together. We hope to resume regular classes the following week, December 16th, but please watch for updates and a complete rest-of-year calendar coming soon. Bill Garr, executive director of Lowell House, along with recovery coaches Gianna and Richard, spoke with TEMV members at our Social Action Shabbat on November 30. Their focus was on addictions, especially opioids. They told us about challenges faced by people with an addiction, some of the services provided by Lowell House, and the impact of recovery coaches for those who currently have an addiction. Thanks to them for sharing their time and information with us!